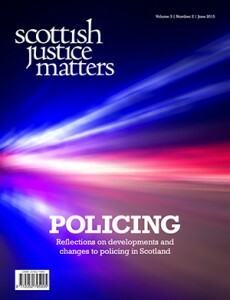 The focus of this issue is to offer a set of broader and deeper reflections on recent changes to policing in Scotland. There are also articles on trauma and research, women in the criminal justice system and third sector funding, and much more. Read on. Buy your own magazine quality copy for $11.80 (about £8.00) from our MagCloud site. Printing is done in Europe and delivery times are usually no more than a week from order. Purchase also entitles you to a free digital version with optimal display. You can also download a free .pdf. Printing off is best done in colour. 1.6MB. If you like the SJM why not help us keep going by giving a donation for the amount of your choice using the big purple button opposite? Louise Jackson is a reader of Modern Social History, University of Edinburgh. Neil Davidson is a researcher with the Scottish Government. 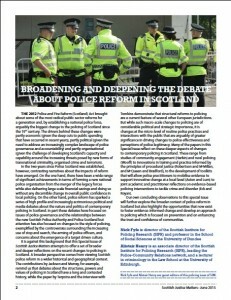 David Smale is an expert on the history of Scottish policing. 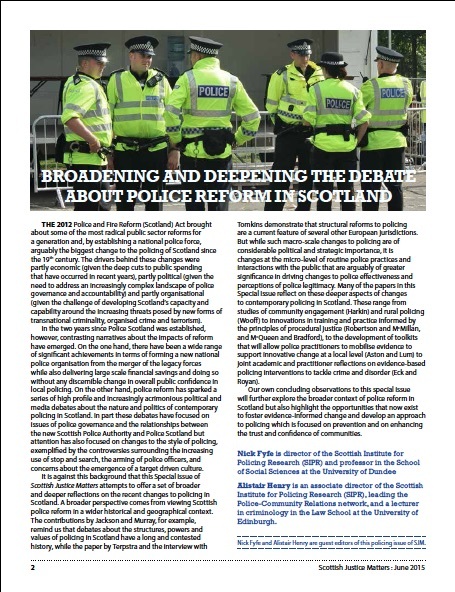 Scottish policing: has there been real reform? Diamid Harkin is is a lecturer in Criminology at Deakin University, Melbourne, Australia and has conducted a number of studies into community policing in Scotland. 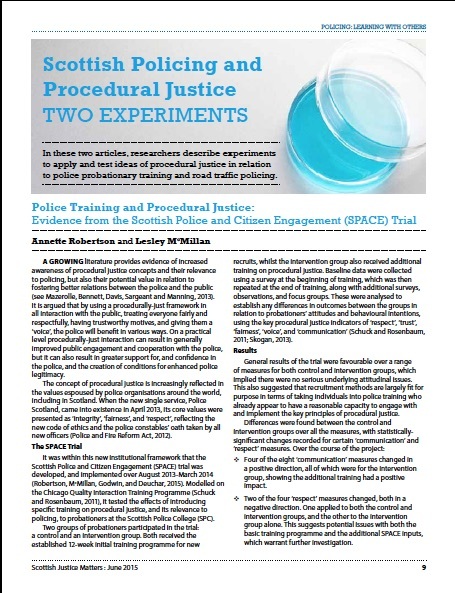 Annette Robertson is senior lecturer in Criminology and Lesley McMillan is professor of Criminology and Sociology, Glasgow Caledonian University. 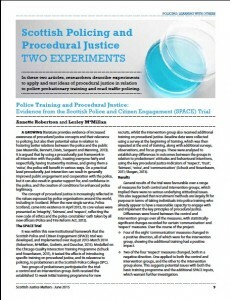 Sarah MacQueen is a research fellow for the Scottish Centre for Crime and Justice Research, University of Edinburgh Law School. Ben Bradford is lecturer in Criminology in the Faculty of Law, University of Oxford. 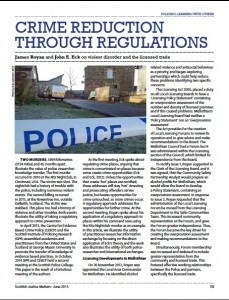 James Royan is a Chief Inspector with Police Scotland. John E. Eck is professor of criminal justice at the University of Cincinnati, USA. “From my perspective the police service is absolutely core to the effective operation of any democracy worthy of the name”. 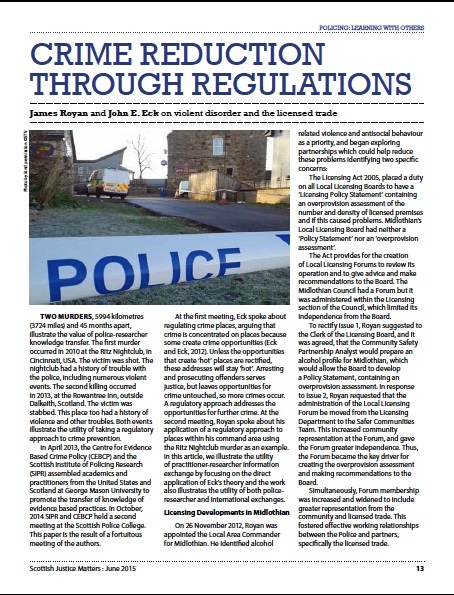 Paddy Tomkins, former Chief Constable of Lothian and Borders Police and head of HM Inspectorate of Constabulary in Scotland, talks to Andy Aitchison, lecturer in Criminology at the University of Edinburgh about his work with the Serbian Ministry of the Interior (MUP). Dr Liz Aston is senior lecturer in Criminology at Edinburgh Napier University. Dr Cynthia Lum is associate professor and director of the Centre for Evidence Based Crime Policy at George Mason University, Virginia, USA. 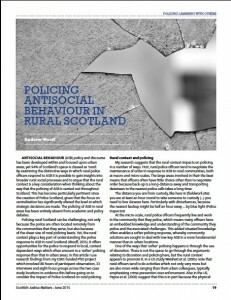 Andrew Wooff has recently been appointed as a lecturer in Criminology at Edinburgh Napier University. 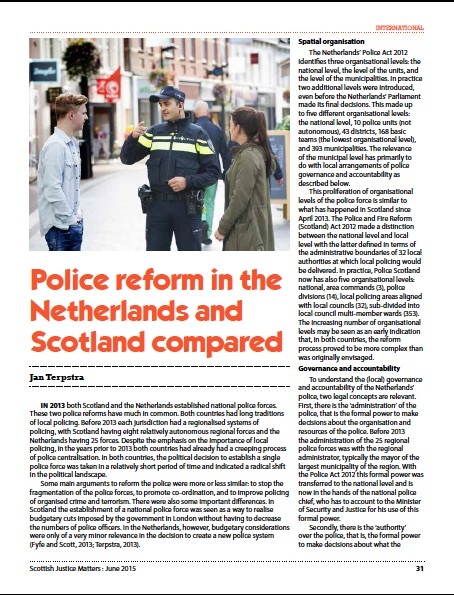 “In this final contribution we place the changes in Scotland in this broader context, underlining the differences in the trajectories of reform across the UK but also the underlying similarities . . .”. Nick Fyfe and Alistair Henry. Maija Helminen is a doctoral candidate at the Faculty of Law, University of Turku, Finland. Stephanie Fohring is a criminologist and research fellow at the School of Law, University of Edinburgh. Anne Pinkman is chief officer of the Fife and Forth Valley CJA, and convenor of the Scottish Working Group for Women Offenders. 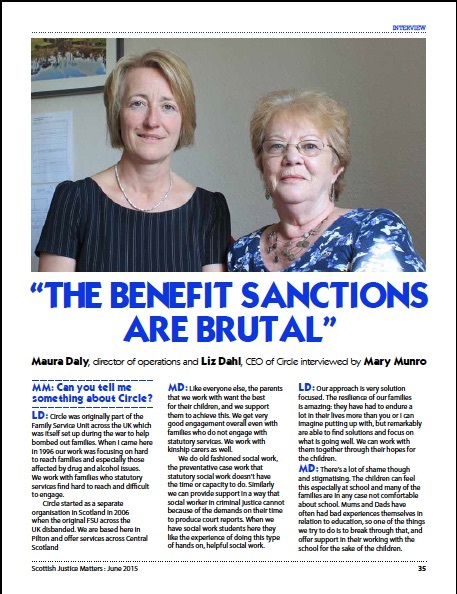 Nancy Loucks is the chief executive of Families Outside, a visiting professor at the University of Strathclyde’s Centre for Law, Crime and Justice, and a member of the SJM editorial board. Jan Terpstra is professor of criminology at the University of Nijmegen, the Netherlands. 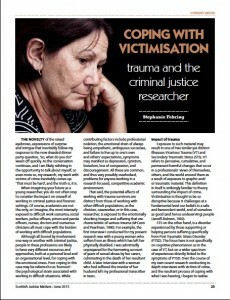 Susan McVie is chair of Quantitative Criminology and director of AQMeN at the University of Edinburgh. Paul Norris is senior lecturer in Social Policy and coinvestigator of AQMeN at the University of Edinburgh. Rebecca Pillinger is an AQMeN research fellow at the University of Edinburgh. Maura Daly, director of operations and Liz Dahl, CEO of Circle, interviewed by Mary Munro. Rhona Hotchkiss, governor of HMP Dumfries, shares a typical week with SJM. 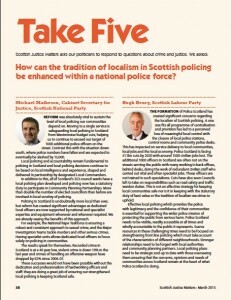 How can the tradition of localism in Scottish policing be enhanced within a national police force? 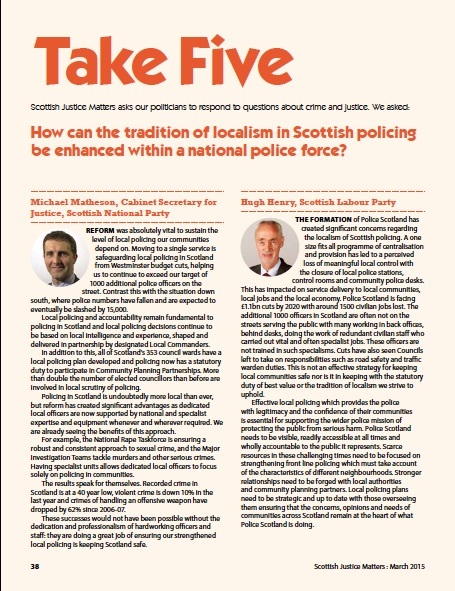 300 words each from MSPs Michael Matheson, Hugh Henry, Margaret Mitchell, Alison McInnes and John Finnie in answer to our question. Ali Malik reviews Conviction: Violence, culture and a shared public service agenda by John Carnochan (2015) Argyll Publishing.